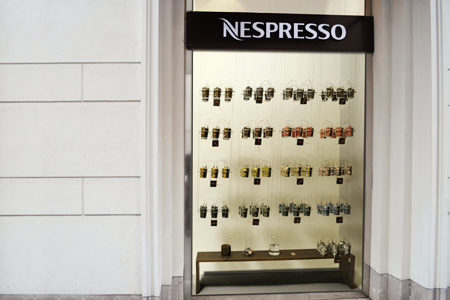 The installation ‘Nespresso-Battery’ demonstrates the energy left in aluminium Nespresso Capsules. 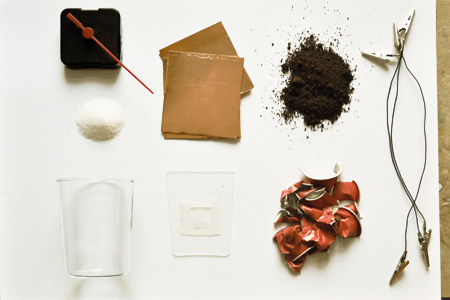 Invisible Energy becomes visual via ticking sweep hands and thus wants to focus on the importance of collecting and recycling the valuable material aluminium and questioning its use in the first place.The energy for the movement of the sweep hands is powered by 17 simple, self made batteries. 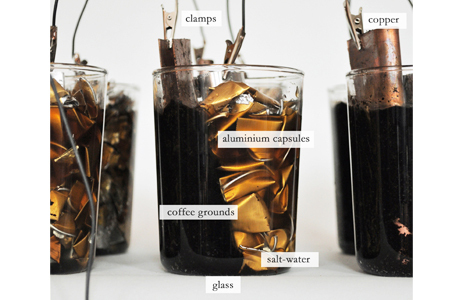 Each battery-block consists of used old aluminium capsules, coffee grounds, strips of copper and salt water. In this mixture between a soil battery and a salt water battery the aluminium functions as the anode, the copper as cathode and the salt water as electrolyte. Due to a chemical reactions a small, but usable, amount of energy is created. Each battery produces about 1,5 – 1,7 Volts of potential and enough power to run a electro – mechanical Quartz clockwork.The content of all 17 batteries (old capsules and coffee grounds) is about ~ 680 -700 Nespresso Capsules – an average year consumption of one person. 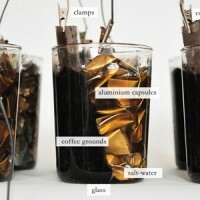 All batteries are interconnected and well moistened would be able to power a small radio.The installation questions the use of Aluminium for one-way packaging and wants to encourage customers to bring their used Nespresso Capsules back to the Boutiques and other collection facilities, in order to be recycled. Obviously the installation is not meant as an alternative source of energy, but shows the energy needed in aluminium production in an abstract way.’Nespresso-Battery’ won the competition and was shown in the display window of the Nespresso Boutique Mahlerstrasse from 1st – 10th of October 2010.